The club was formed in 1910 and initially played in local leagues such as the Bradford League and West Riding League. In 1972 they joined the Yorkshire League, the forerunner to the current Northern Counties East League. They started out in Division 3, finishing as runner-up to Hall Road Rangers in their first season and winning promotion to Division 2. After two 5th placed finishes the 1975/76 season saw them finish 3rd behind Leeds Ashley Road and Guiseley to earn another promotion. They were relegated in their first season in Division 1 after they finished 14th out of 16, although they won promotion straight back the following season. 1979/80 saw their record high finish in the Yorkshire League as they finished 9th in Division 1. In 1982 the league was absorbed into the present day NCEL, where the club remains to this day. As founder members, they were placed in Division 1 North, being moved to Division 2 for the 1985/86 season. Liversedge won promotion to Divison 1 in 1989, finishing as runners-up to Ossett Town. The great form continued and they were runners up again in their debut Divison 1 season. 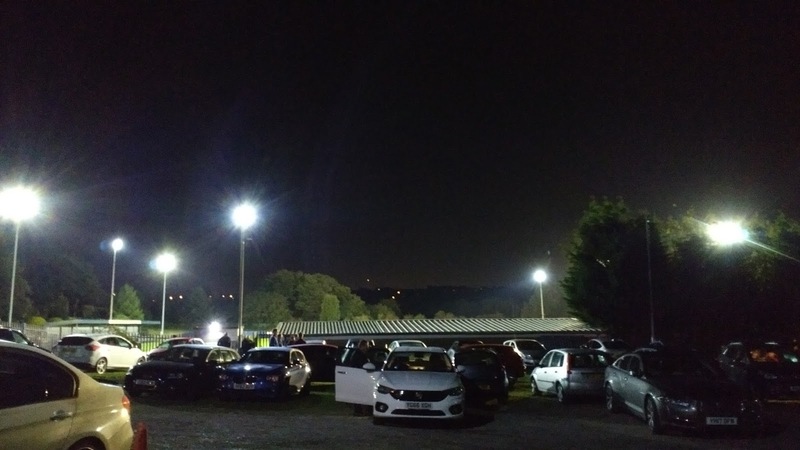 However, due to lack of floodlights, they had to wait until the following season when a 3rd place finish, this time with the lights in place, saw them promoted to the Premier Division.They've remained there to this day and although latterly, finishes have been in the lower half of the table, their best finish came in 2005/06 when they finished as runners-up to Buxton. 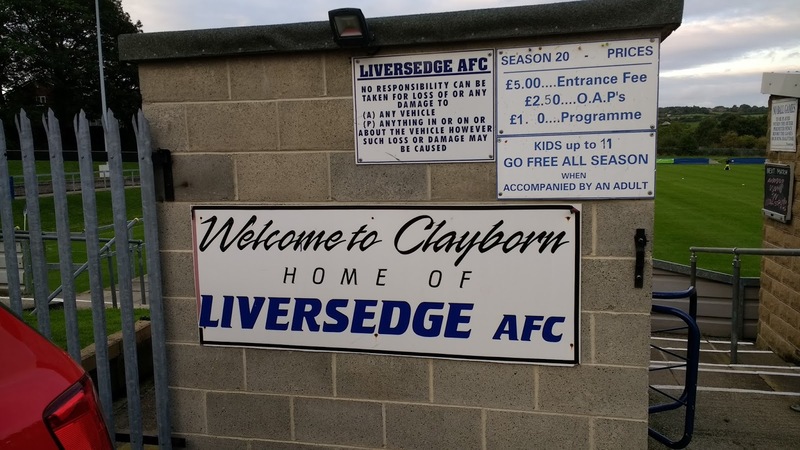 Liversedge have reached the FA Vase 3rd Round on two occasions - in 1975 where they lost 2-1 at Hallam and in 2005, losing by the same scoreline at Leamington. Locally they won the NCEL Presidents Cup in 2008, the NCEL League Cup in 2006, the West Riding County Cup in 1990, the West Riding Challenge Cup three times and the Wheatley Cup on ten occasions as well as a host of other cups from their Bradford League and Spen Valley League days. The club is actually based in Cleckheaton - famous people to hail from here include former Everton player Danny Cadamateri and creator of the 'Mr Men' book series Roger Hargreaves. 2004/05 saw the club's best ever run in the competition when Liversedge reached the 4th Qualifying Round. The Extra Preliminary Round pitted them with a tricky trip to Northern League side Newcastle Blue Star, but it was a test that they passed with flying colours, coming away with a 4-1 win. They faced an even tougher test in the Preliminary Round with a trip to NPL D1 North side Rosendale United but again they came away with a 4-1 win. A third consecutive away game awaited in the 1st Qualifying Round as they travelled to Brandon United and for the third time in a row, they won 4-1. 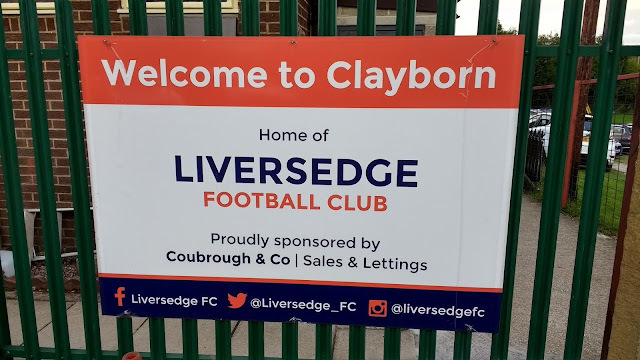 The 2nd Qualifying Round brought them home at last as they were drawn against NPL Premier side Prescot Cables, who played two levels above Liversedge. Prescot were enjoying their best ever season and would go on to finish 5th at the end of the season. But Liversedge's dream run continued as they ran out 3-0 winners. For the 3rd Qualifying Round, there was another home draw, this time against Conference North side Harrogate Town. 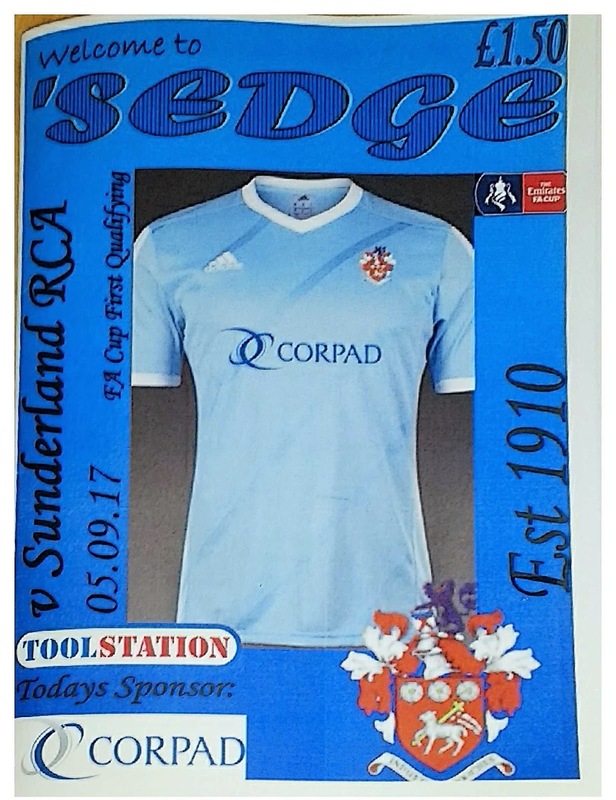 In a rollercoaster game 'Sedge won 3-2 to pair them with fellow step 5 club Coalville Town. The home draw gave them a slight advantage but despite dominating the game they drew 0-0, even having an Asif Hussain goal wrongly ruled out for offside. They lost the replay three days later down in Leicestershire as Coalville triumphed 2-0, earning a trip to Football League Wycombe Wanderers in the 1st Round. Liversedge's debut in the FA Cup game during the 1948/49 season and it was also their joint record defeat as they lost 6-0 at Farsley Celtic. 2013/14 saw them match this as they lost by the same scoreline at Morpeth Town. Their record win has been by 3 goals, a feat that they have achieved on many occasions. 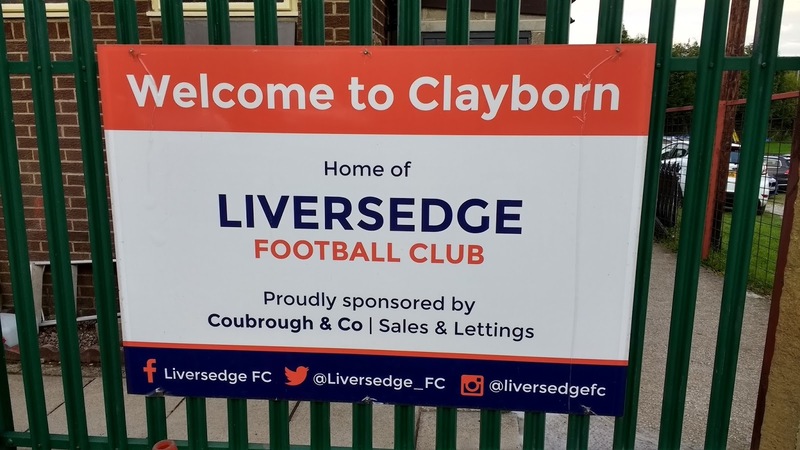 Prior to this season's Preliminary Round replay win against Armthorpe Welfare, Liversedge had gone out at the first hurdle for the previous 5 seasons. They got this far after beating Armthorpe Welfare 5-3 in a replay after the initial tie ended 1-1. 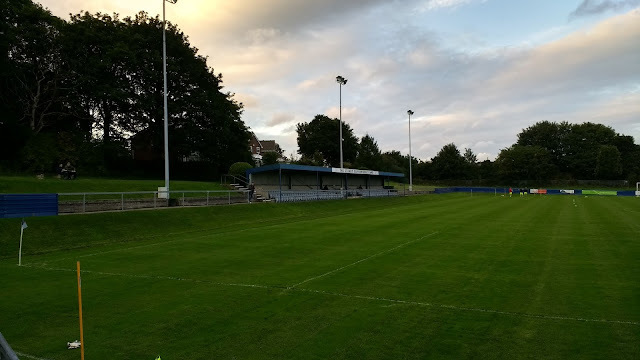 They also won 3-2 at NPL D1 North side Ramsbottom United in the Preliminary Round - their first win against higher league opponents since their 1-0 win against North Ferriby United in 2007. 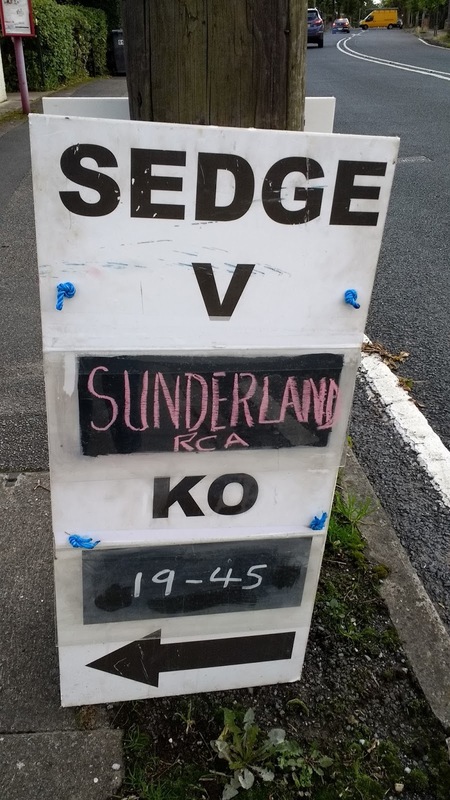 Sunderland RCA was formed as a result of a merger between Kennek Roker and Ryhope Community Association in 1999. Their first FA Cup game came that season as they lost 2-1 at Louth United. They had to wait until 2011 for their first FA Cup win and it was also their record win in the competition as they defeated Birtley Town 7-0. Their record defeat came in 2000 as they lost 5-0 to Salford City. They didn't win again until this season, which has produced their best-ever run. They got this far with a 3-1 victory over Garforth Town and a 4-0 victory over Ashington before Saturday's goalless draw with tonight's opponents. For the first midweek of my fortnight off work, I wanted to continue my quest to see a game in every round of the FA Cup for as long as possible. Out of 15 possible games, three went to replays, leaving me with not much choice. 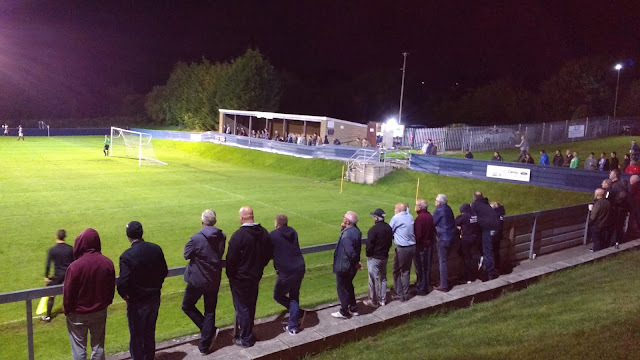 Taunton Town and Mildenhall Town were the other contenders but as Liversedge was a club that I had wanted to visit for ages. They had a personal connection with me personally - back in 2004, they played Coalville Town in the 4th Qualifying Round, with the game going to a replay. Listening to the radio on the coach back from a Darlington v Wycombe game, I was intrigued when we drew the victors. Back in the day, I wasn't familiar with step 5 football and the teams sounded to me like something out of Roy Of The Rovers! I'd visited Coalville a few years back but had always been interested in seeing our other potential opponents that day. I'd been to their ground before - but only got as far as the outside as it was well locked up. I'd even tried to visit for a game before in February 2016, but it suffered a late call off, as did games at Lancaster City and Clitheroe. In the end I went to Ossett Albion, arriving bang on kick off and being very rushed. I was glad that I'd finally get the opportunity to visit and as soon as I got home from Wycombe on Saturday, I booked a hotel for the night. There wasn't a huge amount of choice, but I managed to bag accommodation just over 4 miles away for £24, a decent price considering the late notice. The night before I had a late one after the England game, not going to sleep until 1 am. I had about 7 hours sleep, waking up at 8 and having breakfast and a bath. After that, I walked down to the local shop and got a paper. After scanning in the report, I added it to my blog update before leaving for town at 10. Despite it being widely reported that the kids were all back of school, there were still loads of them in Wycombe and most annoyingly of all, so were my hairdresser's kids, meaning her dog had been left at home. Even so, as my hair was looking a complete mess, I decided to go ahead with getting it cut. There were a couple of people in front of me, so I spent around an hour in there, more than I'd hoped. In the end, I left at 11.30, listening to The Two Mikes on TalkSPORT and Jeremy Vine on Radio 2 on the way up. The last hour of the journey was annoying with nothing to listen to on the radio and I also encountered a big delay for some reason near my hotel with the last mile taking 25 minutes to complete. I got there at 3, checking in and catching up online. I also took the opportunity to charge my camera battery as it was completely flat. I even had time for another bath, partly to wash my hair after getting it cut, but mainly as I'd got a bit hot and sweaty on the way up. I got my things together, before leaving at 4.45. There was frustration before I left though. Initially, I was delighted with my new camera, but as I went to shut it down after testing, it developed a zoom fault. It sorted itself in the end but I was hoping that it wouldn't happen again. 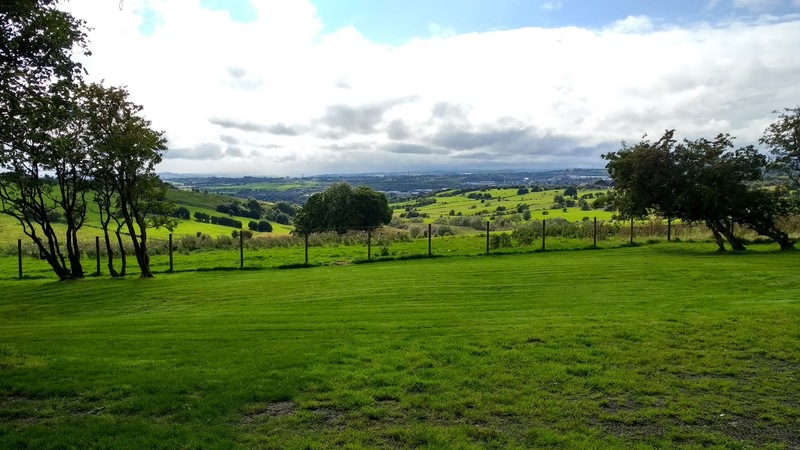 It was a nice walk to Cleckheaton, through some lovely countryside at first. By 6.10 I was in my first pub, the Rose and Crown. This was a lovely place and I tried two of their own Yorkshire ciders, both of which were new ones for me. I didn't want to leave it too late before getting to the ground, so I decided to save the Wetherspoons until after. I also spotted a possible post match drinking place in the Malt Shovel. I was hungry by now, so before heading to the ground, I stopped at Mama Rossa and got an 8oz chilli burger with fries. From there it was to the ground, with me getting there at 7.10. 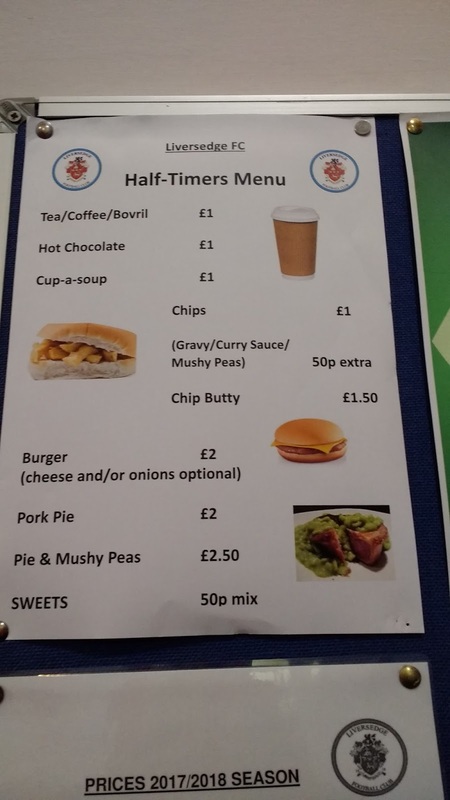 I paid £5 to get in, plus £1.50 for a programme and £3 for a pint of Strongbow. I would have got a scarf too, but I was rapidly running out of cash and £8 was too rich for me, at least with no cash machine. 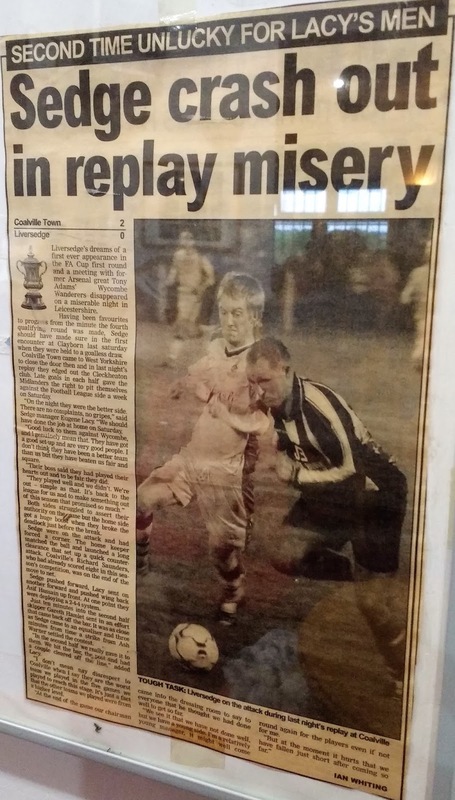 I had a look around the clubhouse, looking at newspaper clippings which had several mentions of my own team, Wycombe from the aforementioned Coalville replay. I then went out, ten minutes before the game to get some more pictures of the ground. There was further frustration with my new camera, there was a spot on the lens and although that could be edited out, I was still planning on taking it back once I got home. The game started with the visitors well on top and indeed Sunderland RCA took the lead after 5 minutes, Nathan O'Neill netting from just inside the area. They continued to dominate with Liversedge relying on attacks on the break. 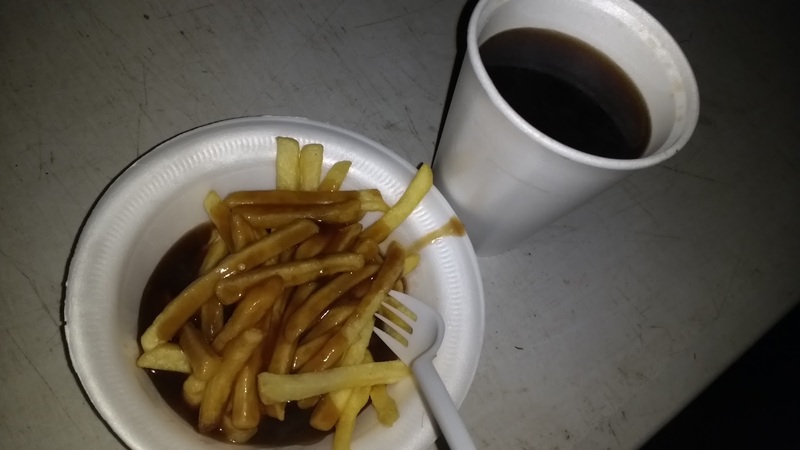 I had a Bovril with chips and gravy at half time which perked me up a bit. The visitors doubled their lead on 53 minutes, again a close range finish, this time captain Greg Swansbury scored from a rebound following a corner. I didn't have the best of views as I was up the end that Liversedge were shooting, hoping for a comeback. None came however and ten minutes from full time the result was confirmed, Sunderland adding a third from Dylan Elliott. With a minute to go, it was 4-0 when O'Neill got his second, this time a low shot went in off the left-hand post. Sunderland RCA were clear and deserved winners, but the hosts would have been pleased with the crowd of 235, which was exactly a hundred above last season's average league attendance. It had been a good night for me, though I'd wanted the hosts to win. I made my way back into town, firstly to the previously scouted Malt Shovel. My nose proved to be accurate on this one and a pint of Sam Smiths cider was consumed for the bargain price of £2 whilst I looked at full-time results from around the country. 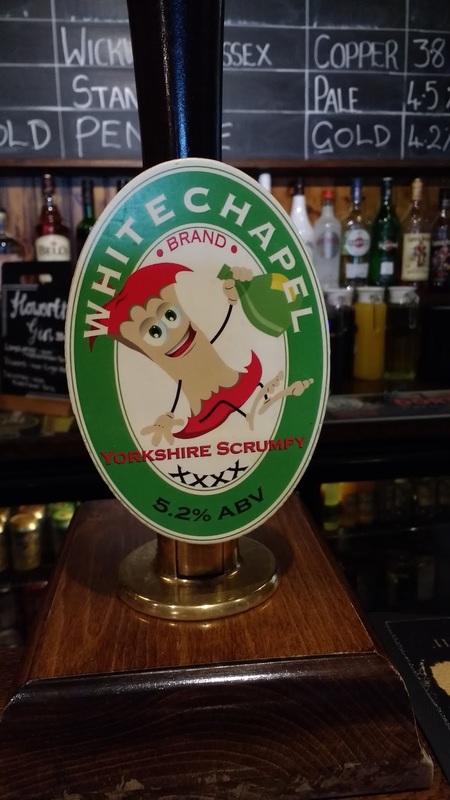 From there I went to the Wetherspoons, the Obediah Crooke. There I had a pint of Black Dragon for £2.75. It was around 10.40 by now and I decided against a second pint, instead getting a Taxi back to my room. 20 minutes later and £7 lighter, I was back at my room. I stayed up for around half an hour, watching some videos on YouTube before going to sleep around 11.40. CLAYBORN is set amongst rolling English countryside making it a pleasant place to visit. It's also walkable from Cleckheaton town centre which has an excellent range of pubs and takeaways. Back at the ground, there is an excellent tea bar with a wide range of hot food at good value prices. 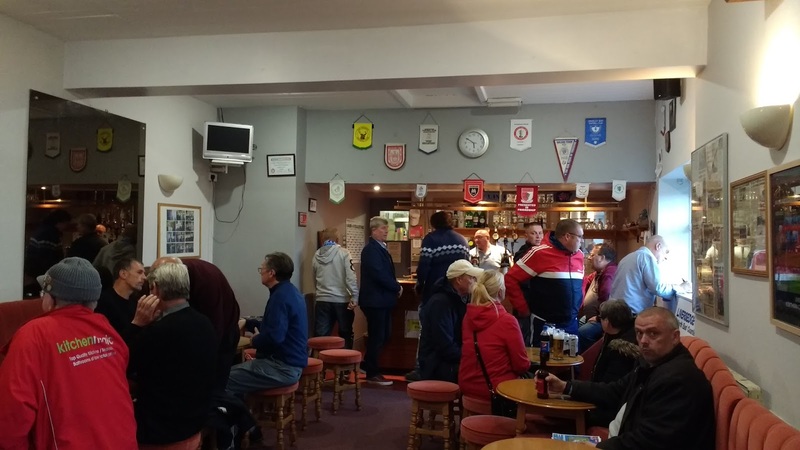 The clubhouse is homely and has lots of interesting stuff on the walls to look at, although as usual with clubhouses, the range of drinks is quite limited. As for the ground itself, there are two areas of cover - a stand along the side of the pitch and a terrace behind the goal, holding around 200 fans each. The rest of the ground is open and has plenty of grass banking, which means you can get some great elevated views of the pitch.